2. A writer gives thanks. 3. Pretty sure I’m an obliger. Love studying and learning about habits. 5. Totally in love with this bracelet! 1. I can’t get enough of Dani Shapiro lately. Here’s an interview in which she gives us a new perspective on self-doubt in writers. 2. Really looking forward to Gretchen Rubin’s new book on habits. 3. Finding and creating poems within a page of text is a fun way to play with words. maybe use it as a warm-up before the work begins. I’ve been thinking a lot about habits lately. I recently finished a 21-Day Cleanse with a group from my yoga studio where we omitted all animal products, gluten, sugar, caffeine and alcohol. I happened to get majorly sick smack in the middle of it so that contributed to the eight pounds I lost. And I admit, I started off doing it for the weight loss possibility but it ended up being more about becoming aware of my habits. Habits like snacking while I make lunch or dinner, “needing” a piece of chocolate after a meal, having that glass or two of wine at the end of the day. Once I noticed these habits then it became about figuring out what feelings were hiding under the habits and you know, feeling them. Crabby, bored, tired, frustrated? Then it was about replacing it with something else. I think that was the key that helped me stay on it for the full 21 days and I still don’t feel the need to go binge on chocolate or wine. Sure, I gave up a lot of things, but I also tried out many new recipes and the food was real, filling and delicious. Many of my replacements involved tea. Instead of wine I’d have a cup of Bedtime Tea. 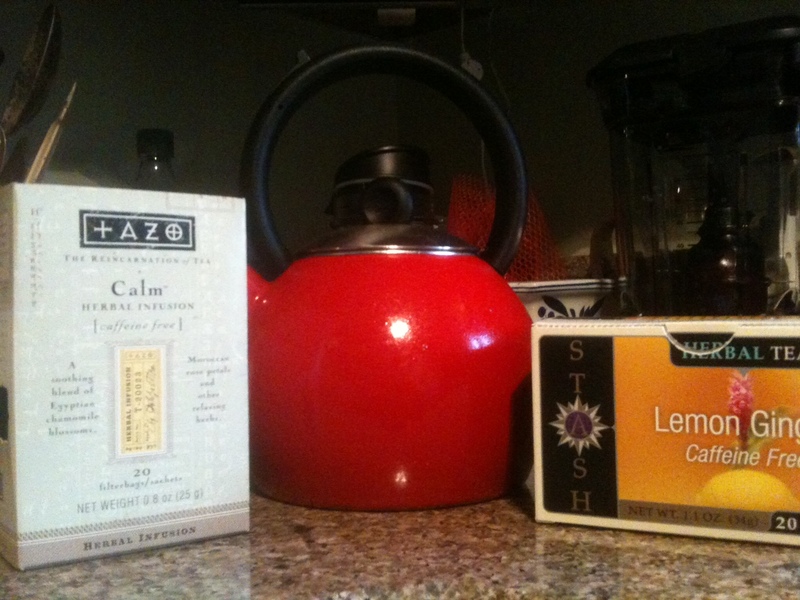 Instead of snacking while I cooked, I had a cup of Lemon Ginger tea. But it wasn’t just about replacing wine with tea. More importantly, the tea didn’t numb me or disconnect me. Instead, it gave me moments to be really present to my life, to my Self. So, these are all habits around food but I am also looking at other habits and hoping to bring the same kind of awareness to them and find more nurturing replacements. Watching TV while I eat? Checking Facebook way too often? Most of my bad habits are really just ways I distract myself. From what is the big question, right? That’s what I hope to uncover. And instead of labeling habits “good” or “bad” I am trying something new. In fact, I used this whole theme when I taught my yoga and journaling class, “Write Into Yoga” earlier this week. I love the idea of identifying your top five values then listing habits that move you toward living those values, those that lead you away from them and future habits that you want to implement that will help you live the values you chose. For example, if I value health I might include practicing yoga in the first column, procrastinating on scheduling my physical in the second and incorporating more cardio into my week in the third. With that in front of me, I see what works, what doesn’t so I can make a change and what other habits I can welcome into my days. As Annie Dillard says, “How we spend our days is, of course, how we spend our lives.” How do you want to spend yours? I used to ask for homework in grade school before they actually gave homework. I think I drove my teachers a little crazy. I just loved going home and doing the work instead of in the classroom. I also think that part of it was the recognition from the teachers. Getting that proverbial gold star from outside myself. Somebody else recognizing my hard work. As an adult and a writer I have to learn to give myself the gold stars, to recognize my own hard work and reward myself for the process of showing up, not merely the finished product. How about you? How do recognize your own hard work? 1. 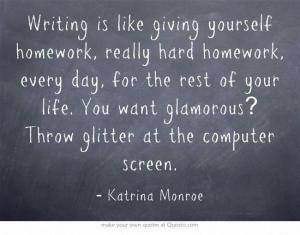 Motivation to finish your novel. 4. Read about this in “O Magazine.” Looks intriguing. 5. I could totally relate to this stay-at-home mom’s experience. Less judgment, more empathy would go a long way in general and among women specifically.